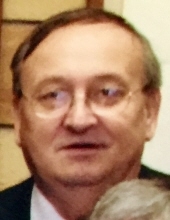 Andrew A. Adamek, 70, died Wednesday, March 20, 2019 at the Clara Maass Medical Center in Belleville. Born in Penley, England he lived in Harrison before moving to Kearny in 1987. Before retiring he worked for Arbee Associates in Union. Earlier he worked in the drug production group for Hoffmann-La Roche in Clifton for 24 years. Andrew was the beloved husband of June Adamek ( nee Casper), the dear brother of Lydia Flock and her husband Joe; the cherished uncle of Kelly Viola ( Brian ), Meredith Flock ( Tom Greene ) ,Jeffrey Flock and many other nieces and nephews; the loving great-uncle of James and Michael Viola and many other great-nieces and great-nephews. Relatives and friends are invited to attend the Funeral Service at the Parow Funeral Home 185 Ridge Rd., North Arlington on Friday, March 22nd at 11 a.m. Interment will follow at Holy Cross Cemetery, North Arlington. Visitation will be held at the funeral home 10 a.m. until time of Service. To send flowers or a remembrance gift to the family of Andrew A. Adamek, please visit our Tribute Store. "Email Address" would like to share the life celebration of Andrew A. Adamek. Click on the "link" to go to share a favorite memory or leave a condolence message for the family.